We need to go over what is Snapchat exactly before we can talk about anything about the app itself. Snapchat is a social media sharing app that enables the users to filters on their selfies or photos. A selfie is a self-portrait photo. A filter can be anything from a color change to a face swap with another person. The app also allows the user to record a "story (short video) about pretty much anything. What is a unique thing about Snapchat is that the photos or videos you make only last a few second and then they self-destruct themselves so no one can see them? The Co-Founders of the company are Evan Spiegel and Bobby Murphy. The company was founded out of dorm rooms in 2011 at Standford University. 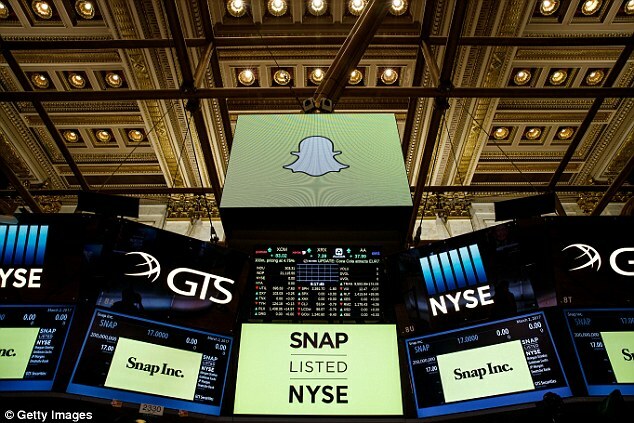 The very well-known social media platform known as Snapchat went live on the stock markets yesterday. 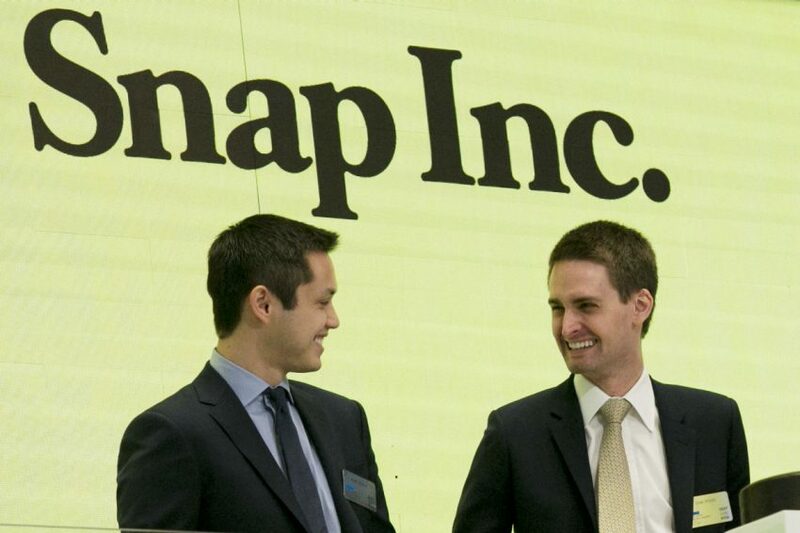 They call themselves Snap Inc and in one day made thirty-three billion dollars. This is insane because they started off their share price at 17$ and ended the day at 24$. Even today their shares still grew to a cool 25+ $ per share. This is something that I personally have never seen on the stock market and overall this makes it insane and almost crazy to believe that a company in one day can create so much wealth. Snapchat also overdid its expectations, because it most probably did not seem to have an overly large ability on the stock market before hand. However, it outdid itself and many people bought the shares of the company that made the owners of it tech billionaires. 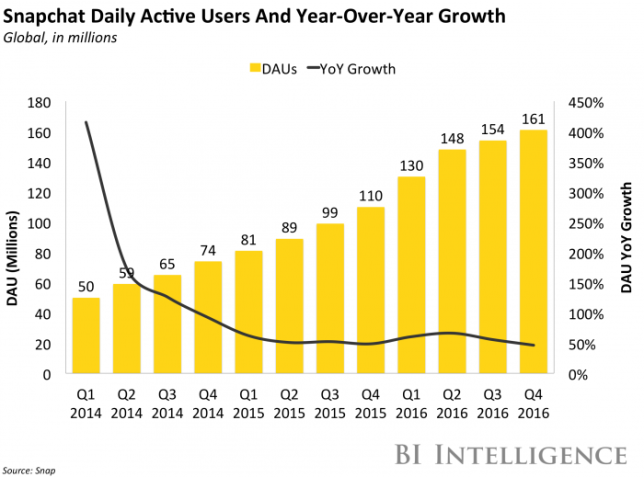 Snapchat is likely to keep growing but it needs to keep its young audience on the site for longer times so that they can show them ads or other ways that the company can make revenue and hopefully make a profit. While shares seem to only be rising in the current time, we have to think to ourselves that the price will continue to go up for the mean time since there is no competitor to Snapchat that can dethrone it as its king. 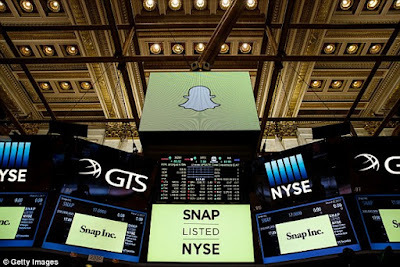 Snap first opened up on the markets with an estimated price of 14-16$ per share while not su[risingly it grew to 24$. This higher trading price really did demonstrate how high the demand for Snap's shares really is. This demand is high because of the originality of not only the app but also the company as a whole. Snap's introduction to the stock market is pretty awesome. In general social media firms that have gone public have had checkered success. Facebook is a great example of this because it had a lot of skepticism about it allowing ads on the website however it turned out just fine. It also had a slightly glitchy launch. It closed at its opening price of 38$. Snapchat did have an advantage, though. They are new for one and secondly, they started off pretty early at getting news outlets the ability to have more viewers. Snapchat now has the ability to show its 158 million users news that goes on either around them or around the world. This was a great move and most likely aided to the success of Snapc Inc on the stock market because it has a young audience that is slowly getting more interested in the news around them. 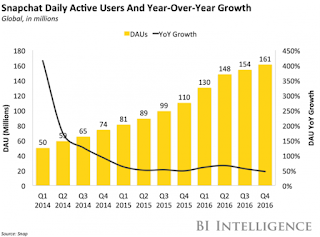 However, some of the people who are a little more skeptical have said things along the line that Snap has cashed in on the short attention span of its young user base. Some other people have claimed that Snapchat looks a little Twitteresque at least for now. This can encourage other tech firms that already have a following but have not gone public on the stock market to do so while they have a great following. If this is done with other firms it will also help the overall stock marker and the company gain revenue if it ever needs to be sold. Snapchat has been a great example for other companies who are not too sure of they should go public on the market or not. These companies now have even more evidence of if they should do it or not. Well, the future of Snap Inc and of course Snapchat is both good and bad because it can go either way depending on the decisions that are made by the higher ups in the company. The thing about Snapchat is that it limits its audience. How does it do this you might ask? Well, it does this by only letting mobile users use the app while other social media outlets like Facebook Twitter and even Instagram let users post, share, and interact with the content. However, Instagram does not allow desktop users to post on the site but at least they allow you to see the site. Snapchat, on the other hand, is almost entirely mobile driven. The actual website it not really that useful as the most useful feature is deleting your account. On the other hand revenue wise the app has so much unbelievable potential. If ads are actively and not damaging the user experience they can make a great deal amount of ad revenue off of the app itself and gain considerable profit. They can also with this option increase a growing user panel where more users come for the useful and new feature that they can introduce. Okay so, I think that Snap Inc is awesome and it's great that they have done really well so far with their stock options and how much they have actually made so far. 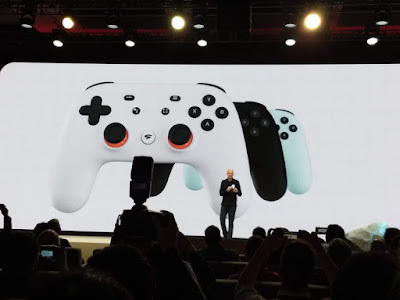 However, they have so much more opportunities now that they can use to not only expand their user base but to also expand their revenue and profit base. If they find the right way to go about doing this they can become a great media platform and never lose their audience. I also think that Snap Inc should expand its company a little bit so it can be known for more than just the Snapchat app. The Snapchat app, however, is a great social media platform that I think it amazing.